It’s been a long while since I posted about cooking, though I cook almost every single day. Of course, not everything I cook is blog-worthy, but occasionally I find something I really want to share. While watching an episode of Jaques Pepin’s More Fast Food My Way I saw him do something quite extraordinary with a few simple ingredients (that actually happens pretty often on the show, which is one of the reasons I love it so). So here it is — you can follow the link above for the exact measurements, which I did not use. He took a package of whipped cream cheese, then mixed in some sour cream and two eggs. He whisked it together until smooth (from this point on I will refer to this as the cheesecake base, for reasons I hope will become clear). 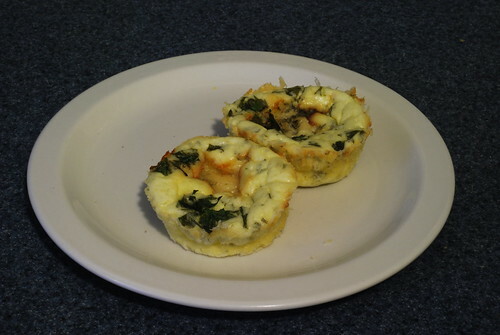 On the show, Pepin made blue cheese cheesecakes, so that’s what I started with as well. Into the base went salt and pepper, some crumbled blue cheese, and some chopped parsley. His daughter buttered the ramekins they used, but they forgot to coat them with breadcrumbs before adding the mixture. I did not forget. 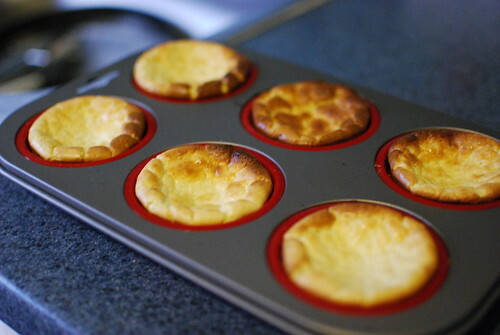 Note that I used disposable mini muffin tins, so my cakes were smaller than Pepin’s. He poured in the blue cheese mixture, then added a small piece of blue cheese into the center of each cake, and topped with more parsley. Then it gets baked at 350 degrees for about 20 minutes. I found my cakes needed about 28 minutes, and they didn’t puff up nearly as much as Pepin’s. On the other hand they were damned delicious. On the show, Pepin mentioned that you could use this base to make just about any kind of cheesecake, so I set out to prove him right. I’ve made this recipe about six times now, each slightly different. First I tried a sweet variety — I made the base and added a pinch of salt and plenty of Wisconsin pure maple syrup. Then I baked them for about half an hour. The result was stunning — maple cheesecakes! I also made a blueberry cheesecake, by making the base and then adding some homemade blueberry syrup (that’s coming in a different post). For the blueberry cakes I also added one whole blueberry into the center of each cake. THey fell apart a little bit, but they were great. 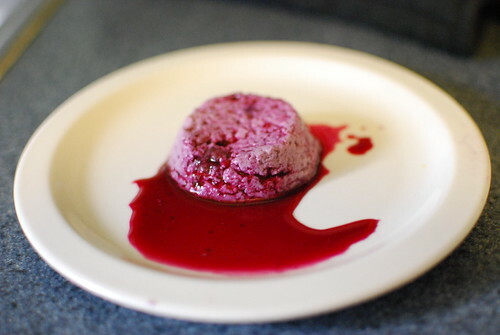 I garnished with some more blueberry syrup. 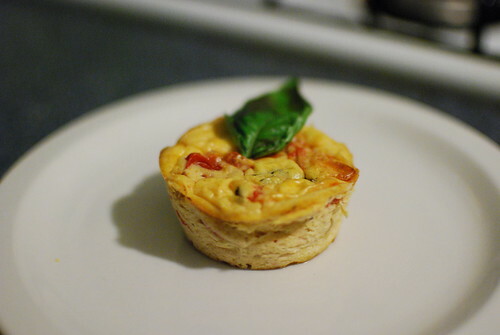 I also made more savory cakes. Into the base went some cooked cherry tomatoes, some basil, and some grated parmesan. It came out tasting exactly like pizza, which was awesome. I did find that the pizza ones cooked better at a higher temperature. Most recently I made a more standard cheesecake, sweetened with sugar, but I added the zest of two limes. This gave the cakes the wonderful aroma and flavor of lime without the acidity. I highly recommend adding these cheesecakes to your repertoire — they’re amazingly easy and really good. I made them so many times that I went out and bought a real muffin tin so I could make them over and over again. Thank you, Jacques Pepin, for giving me another great recipe!